According to an article published in Nature magazine in July, the current trade war between the United States and its main partners could provide an opportunity to tackle two multilateral problems at the same time: protectionism and global warming. As trade relations between the greatest economic powers of the world are becoming increasingly tense, the authors of the article (Michael A. Mehling and others) suggest that governments should introduce a carbon charge on imports. This would promote sustainable trade practices, while complying with the pledges made at the Paris Climate Summit in December 2015. According to the article, carbon border adjustments should impose the same economic burden on domestic and external manufacturers. By restricting trade in carbon-intensive goods, these measures would accelerate decarbonization, enhance research and development, and incentivize the production and export of low-carbon products to avoid penalties. In some sectors, this prospect has already led to new innovations, such as the search for alternative production methods. As explained by Stefan Savonen (see picture above), Vice-President of a Swedish mining and steel producing company, LKAB is currently testing new methods, whereby the use of coal would be replaced by hydrogen in the production of steel. According to Nature magazine, carbon border adjustments would fall under a set of exceptions stated in WTO regulations: measures “necessary to protect human, animal or plant life or health” or “relating to the conservation of exhaustible natural resources” can be introduced without contradicting WTO rules on non-discrimination. Such measures must include documentation spelling out the environmental goals, and the fees need to be imposed through a transparent and fair process. Environmental justification can be further strengthened by using the revenue to fund mitigation and adaptation efforts. The European Union would be in an ideal position to introduce such measures. It represents a group of countries with uniform trade policies that would provide a strong counterbalance to tariffs imposed by the United States. By targeting countries that are not party to the Paris agreement, and by basing its measures on the carbon intensity of goods, the EU could send a strong message about the importance of climate change. Green Budget Europe has been promoting the introduction of carbon border adjustments since 2016, when it published a report on Green taxes as a means to finance the EU budget. Its current Director Eero Yrjö-Koskinen called for such measures upon his nomination in June 2017. He reinstated GBE’s position on this topic during the public hearing on the EU budget and the Paris Climate Agreement organized at the European Parliament in April 2018. 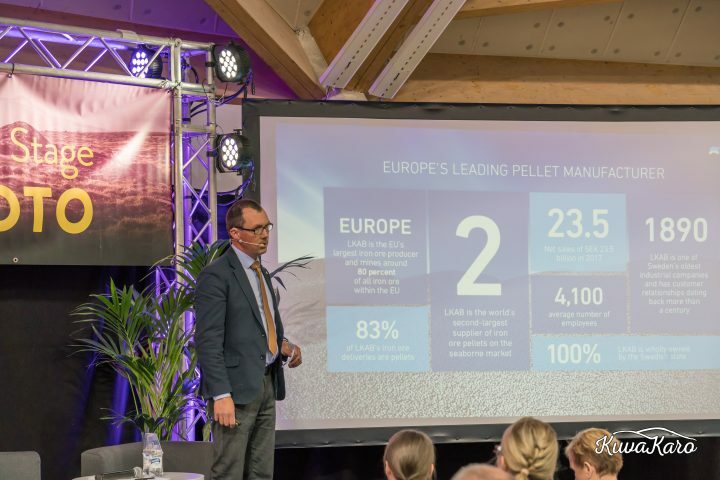 Picture: LKAB Vice-President Stefan Savonen introduced new production methods in the steel sector during his presentation at the Northern Industry event organised in Oulu, Finland, in May 2018.